There's been a lot going on in the USA the past few weeks. Storms, elections, a shocking basketball trade for us OKC Thunder fans.... Well, the election is over. The trade has been made. The clean-up has begun. For some of us in the OKC Modern Quilt Guild, hurricane Sandy hit a little to close to the homes of those we love. Parents, relatives and friends were left for days without electricity and with dwindling food supplies. Others had significant damage. Thankfully, everyone is safe. There wasn't a thing we could have done to prevent the storm, but we're hoping there's a little something we can do to help those who were affected. Our guild members are currently working on a quilt that will be raffled off with the proceeds going to the Red Cross. 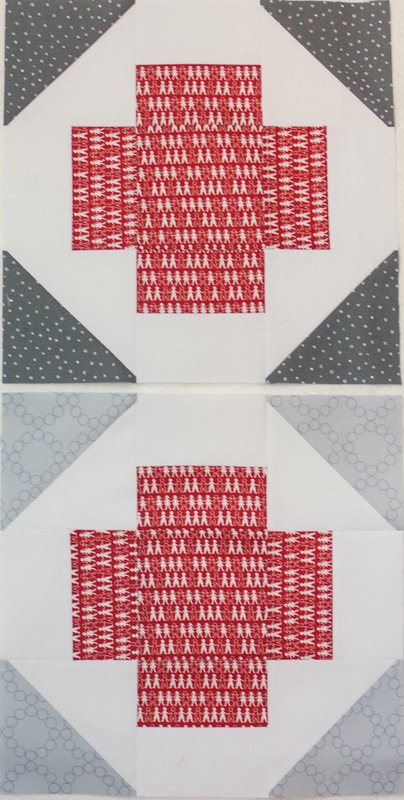 We're all using the pattern you see with the guidelines to use red, white and gray. A few of our member have already started and I'm hoping to get mine done this week. I think Angelina came up with the idea for this quilt, and here are her blocks. I love her mix of prints. Amanda from The Cozy Pumpkin made hers as well. This is going to be a quilt that makes a statement! We'll have more information for you as we complete the quilt. Bri has been participating in a Row Along over at Bee in My Bonnet. Here are her first four rows. Bri hopes to get Row 5 (flying geese) done before Row 6 is published today and says, "Probably won't happen. LOL"
I have to tell you, Bri, flying geese are NOT my strong point so good luck! I do love that little row of apples. Emily is working on a quilt that was originally going to be a much larger quilt for her daughter's bed. expecting sister-in-law. "We will see..." she says. In non-political voting news: Our OKCMGQ elections are THIS Saturday! You have to be a paid member to vote, but it's never too late to join. Just click the Paypal button on the sidebar you're good as gold! Okay...those apples are DARLING! I see a table runner in my future!!! And are there gnomes on Emily's blocks?! The cuteness!!! Leslie - You should check out Lori Holt's method for making flying geese. I had never done it this way, but they go together fast with no wasted fabric....I only have four made so far....and today's new row is cocoa mugs...cute!